Fidelis Onyebueke, is the former President of Igbo Community, Calabar, Cross River State. He is also the former vice chairman of the Nigeria Bar Association (NBA), Calabar. He stated that it is high time the ruling All Progressives Congress (APC) zones the Senate President slot to South East as a way of healing the wounds of marginalisation. He admitted that there were security challenges in the 2019 elections, but described it as the best so far considering the fact that PDP made in-roads into APC strongholds in the North and South. You predicted President Buhari was going to win in 2019, just as you did in 2015. Do you think he merited his second coming considering the alleged hardship and sectionalism that characterised his first term in office? Again, in his second coming I still maintained my stand that Buhari would win no matter the gang up and it came to pass. He merits the second term because he is a man of integrity and has the love for the country. Agreed that as a human being, he made serious mistakes starting from the issue of the herdsmen, which he didn’t come out openly to condemn, and the lopsided appointments he made. Economically, he didn’t do well considering that PDP ran a voodoo kind of administration for 16 years and Buhari not being a 419 man didn’t know how to go about it. He didn’t know how to start and how to end because he thought he was dealing with human beings and the moment he came in, we entered into recession which was caused by the mismanagement of our resources by the previous administration. On the fight against corruption, it is the best so far any leader could do in this country. None of past leaders would have the courage Buhari has to fight it to the point of allowing his own friends to be tried and jailed. They would have played politics with such situation. But he has stepped on many toes without minding whose ox is gored. Many generals, governors have been arraigned, tried and jailed by the EFCC; even his former secretary to the government has also been arraigned. Is it Obasanjo, he did not help matters in this country; he is not consistent. Is it IBB, he brought us to our present situation; so we have to give credit to Buhari. That he is selective in his probes is immaterial to me. Whoever comes after him should continue from where he stops, maybe a PDP or someone from another party because I know that after Buhari leaves, APC will die. However, I didn’t think that any other person would be able to defeat him bearing in mind the humiliation he suffered in 1984 when he was overthrown. Certainly, the mistakes he made cannot be compared to the successes he made within three and half years. I am happy he won. In this present circumstance that he has won election for the second term, which areas would you expect the president to improve upon? He disappointed many people in his first tenure because people thought that his coming would automatically bring sanity to the system but it wasn’t so. We still have criminals around him. In this second coming, he should be able to bring Nigerians together by ensuring that his appointments reflect the six geo-political zones. He should not continue with the idea that 95 per cent of those who voted for him will benefit and 5 percent that did not vote for him will not benefit. That concept of power sharing should be jettisoned outrightly. Nigeria has various ethnic, cultural backgrounds and various beliefs. Therefore, Buhari should be fair to everybody and every part of the country, especially the Igbo. Agreed that the Ohanaeze leadership adopted Atiku, but that is not enough to punish the whole zone, after all we still have sizeable APC members who stood with APC throughout the election. Ohanaeze adopting Atiku to me wasn’t a good politics anyway. Look at the South West during presidential election they shared their votes between PDP and APC. So I expected Igbo to do the same thing. 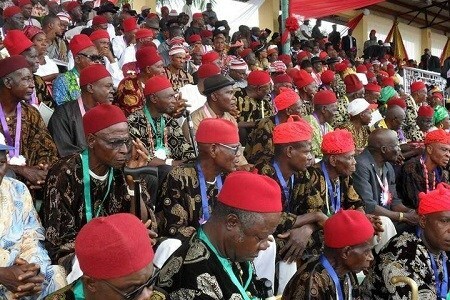 Igbo should know how to play the politics of appreciating other parts of the country. We have our various ethnic talents in Nigerians. Igbo economic ideas, Yoruba’s have policy ideas and Hausa/Fulani have political idea; we will never be at the same level at all. The 9th National Assembly would be inaugurated in June and there are agitations that the Senate President be zoned to Igbo since they now have ranking senators and gave Buhari some reasonable votes this time. Do you subscribe to such agitations? Definitely, it should be zoned to the South East as a way of healing the wounds of marginalisation, even though the Igbo did not vote for him massively. It should be given to any ranking senator or former governor, but not Okorocha. I won’t also like the Senate President or Deputy to be given to PDP from the South East because they caused havoc during the first tenure of Buhari. When I saw former senate leaders Lawan, Ndume and others scheming, I felt disturbed because that is not how to run the country. The zoning system in the Senate of 2015 should be dropped, there must be a re-arrangement, in such a way that an Igbo Senator emerges as Senate President. I appeal to the presidency to get involved in the selection of its National Assembly leadership and ensure justice is done to Igbo in 2019. In the 8th assembly, Buhari was pretentiously behaving like nothing was wrong until they dealt with him. You see what is happening now he is also pretending that he is a democrat, which is why he is losing grounds everywhere. It won’t happen during Obasanjo’s regime, that you allow an opposition party to control the legislature. But let his involvement be skewed towards South East rather than listening to people with an eye on 2023. Looking at the just concluded elections, can you rightly say that the election was free and fair in all ramifications? This is best election in this country baring human errors compared to PDP organised elections. Obasanjo did not allow his opponents to have any chance. Atiku won in many areas unexpectedly. You see what is happening in some states where PDP won. Look at Bauchi, Benue, Sokoto and Ondo PDP won. If it were to be during Obasanjo’s regime, you won’t even dream of it and based on those indices this is the best election we have ever had if we are sincere with ourselves. The security challenges we saw were human errors and I feel that the next election would be better than this. INEC and judiciary have been criticised for the poor conduct of 2019 elections. What are the areas you think should be improved upon in our electoral process? Our electoral process should allow parties to nominate their candidates. A party is the sole authority that should present a candidate. They should not allow courts to give funny rulings here and there. Our judges are not to be believed nowadays because one court in Abuja will give judgment and another one in Aba will give a different judgment on the same issue and that is an act of irresponsibility. Court has no business in selecting party candidates. If you are not happy with the decision of the party, you can leave the party. See what happened in Rivers, no candidate for APC. To me it is a breach of the fundamental right of the APC members by not allowing them to choose a candidate of their choice which supersedes the electoral law and the constitution of the party. Not everybody is a member of APC but everybody can vote for APC without being a member and the decision of the courts are surprising to me in the case of River State. They should have used the case of 1979 or 1983, Awolowo versus Shehu Shagari. It was done in the interest of peace in the country.